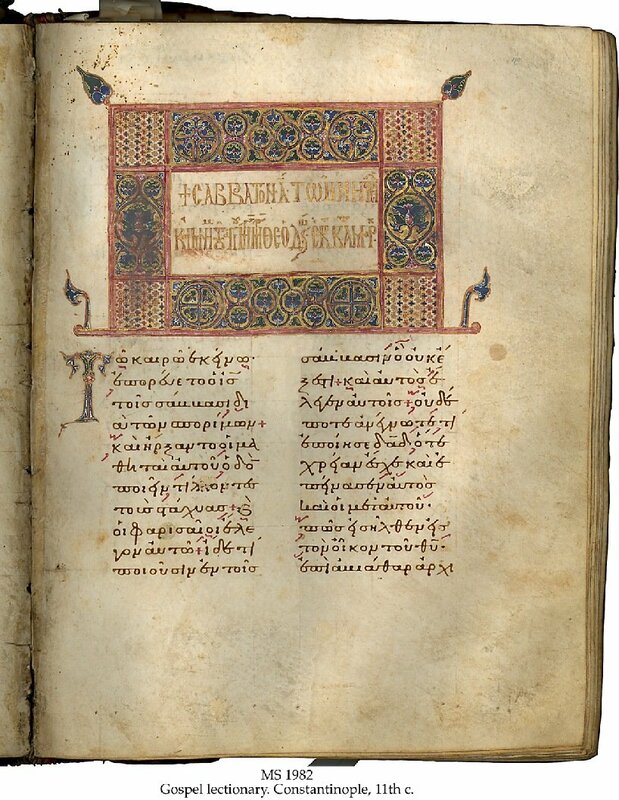 Description	 MS in Greek on vellum and paper, Constantinople, Turkey, 11th c. with additions ca. 1400, & 16th c., 277+49 ff. 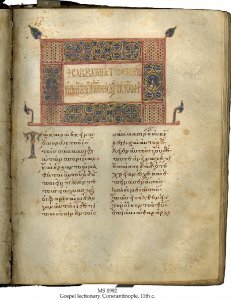 (-19), 33x26 cm, 2 columns, (22x16 cm), 23 lines in a fine flowing Greek minuscule, and clubbing Greek uncial, 1/4 of the 2nd half of the MS in gold script, ecphonetic notation in red, heading and small initials in gold over red, large decorated initials in gold, red, blue and green, up to half-page headpieces, 3 decorated in gold and colours, the ca. 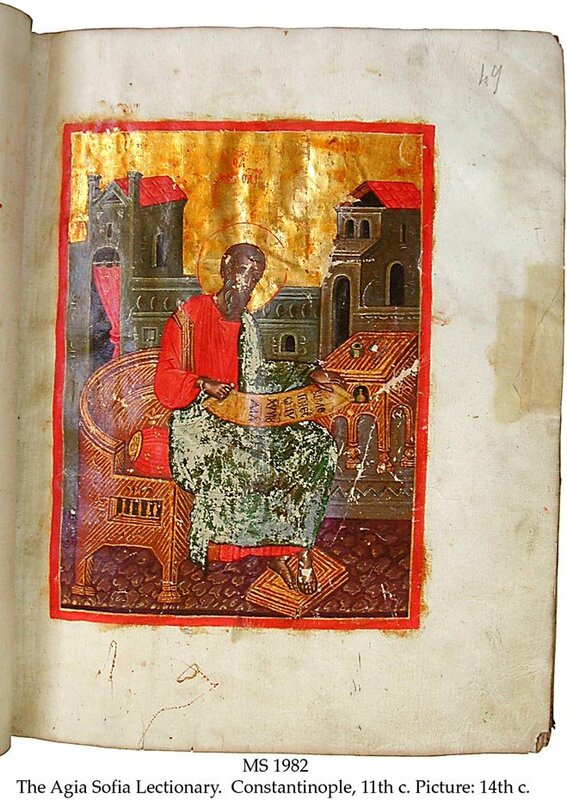 1400 additions by the scribe Ioasaph, 16th c. full-page miniature of St. Matthew. 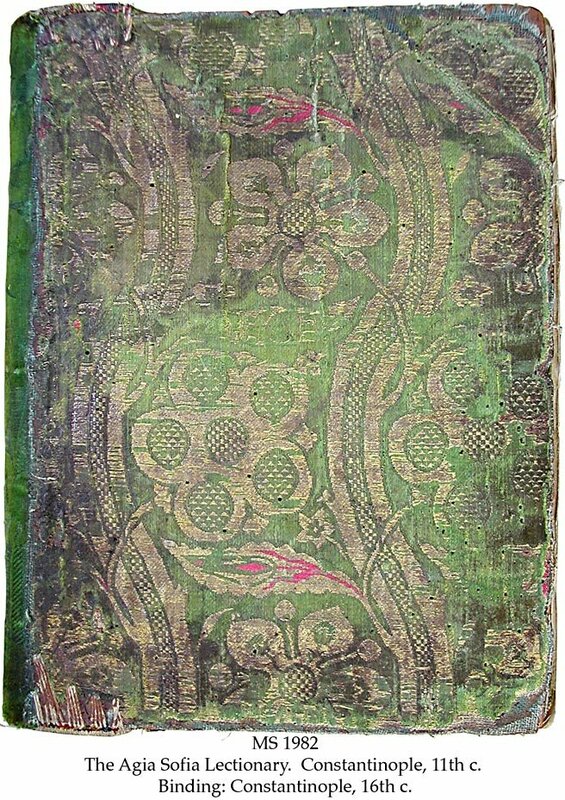 Binding	 Constantinople, 16th c., green and gilt damask with floral decoration over light wooden boards, chain stitches on 5 sewing stations, spine raised "alla Grecca". Provenance	 1. Agia Sofia, Constantinople (11th c. - ca. 1400); 2. Monastery of the Theotokos, Constantinople (ca. 1400-); 3. Papas Andreas (1849-1858); 4. Sam Fogg, London. Deaccession December 2010. Commentary	 Over one quarter of the second half of the MS is entirely written in gold. The ecphonetic notation was partly a forerunner to the neumes. Aland l. 2404, text category 5 (Byzantine recension).